Available in the Caribbean only. The result of extensive research by PelGar, Roban Bait Blocks brings to the market a highly palatable formulation suitable for use in all climatic conditions. Roban Bait Block is a ready-for-use bait formulated using high quality culinary grade wheat flour, blended with chopped wheat, other cereals and proteins which are bound together by edible waxes. The addition of other food grade materials improves palatability compared to other extruded or cast blocks ensuring excellent bait ‘take’. The incorporation of bio-stats inhibits the growth of both fungi and bacteria should the block be exposed to damp/sewer conditions. Roban Bait Blocks also contains an aroma, giving a unique chocolatey smell. 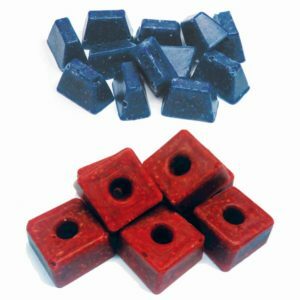 Roban Bait Blocks are manufactured by a hot casting process ensuring the wax and other components are intimately mixed together. This process ensures blocks are highly tolerant to humidity and suitable for use both indoors and outdoors. The blocks have a hole through the centre that allows them to be securely fixed in a bait station. Roban Bait Blocks blocks have a nominal weight of 5, 10 or 20g. Pack Sizes: sachets of 100g and 500g, 10kg and 20kg pails.